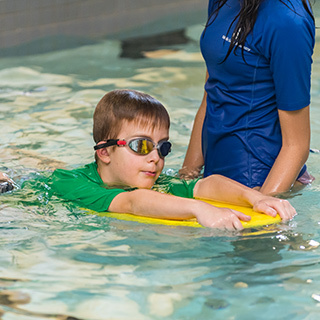 With our swimming lessons, a session at The Swim Academy runs once a week for seven weeks. Classes vary in size and time depending on the level and ability of the student. Notification of your time slot will be received a week prior to the start date of the session. We try our best to schedule families and carpools at the same time, but in some cases back to back classes will be necessary. Instructors use the same teaching techniques to ensure development throughout the sessions. We will take instructor requests, but we cannot guarantee that they are fulfilled. Missed Classes: We offer make up classes however we can only do so where instructors are available. Make up classes are not guaranteed but we will try to accommodate as best we can. Payment: Registration for a session must be accompanied by payment in order for a spot to be reserved. There is a cancellation fee of $20.00 per child if the session is cancelled within one week of the start date. We will not offer refunds after the start of a session. If a serious medical condition should arise, a credit will be issued for an alternate session. Thank you for your understanding. We teach according to the child’s ability, not by what “level” they are assigned. Sometimes children amaze everyone and jump levels. 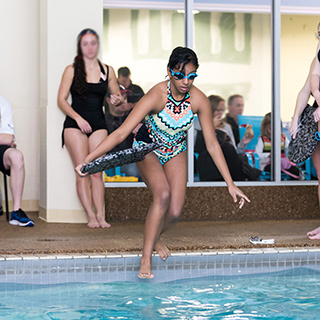 At The Swim Academy, children that surpass expectations, are pushed by the teacher to do their personal best, and not held back because they catch on quickly. In most cases, one child’s eagerness can motivate the rest of the class to try harder. What a great influence!! These classes are 20 min private lessons allowing us to build trust with the child and customize the classes according to their strengths and weaknesses so they get the most out of the classes. Once your child has surpassed the beginner stage and is ready to learn the strokes we will concentrate on the front crawl and back crawl as well as lay the foundations of Butterfly and Breast Stroke. We keep our class sizes small. Our Pre Junior Silver to Junior Gold classes are 30 min semi private classes, at the most, a full class has 2 children to every instructor. With these small classes, it is easier for the kids to get the personal attention that is so needed to develop a strong swimmer. We motivate the children by awarding them with ribbons for the lower levels, medals for the junior levels, small trophies for the intermediate swimmers, and larger trophies for the senior levels and higher. When a swimmer sees the reward for working hard….they try even harder! 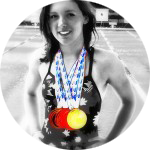 We teach the 4 main swimming strokes…front crawl, backstroke, breast stroke and butterfly. Our instructors break the strokes into segments and teach each piece with different techniques and drills to help the swimmers understand how to swim the stroke better and with less effort. At the higher level of our lessons, the swimmers are taught to challenge themselves. From Intermediate Bronze to Royal Olympic our classes are in small groups of 4 for 40 min in length. Our Royal Olympic levels are combined with our Master levels, to try and challenge the swimmers to out swim themselves. Each of the 6 levels of the Royal Olympic levels are based on a timed swim. When a swimmer is able to swim a certain distance under a certain time, they are rewarded at the end of the session with a large trophy for their accomplishment. Like all great swimmers, they started in a lessons program that worked on the technical aspects of each stroke. With proper training, dedication, and the right teachers, there is no stopping a swimmer determined to reach higher levels of swimming. It all begins here with the right lesson program. New to OSA or swim lessons in general? The table below provides an overview of the different swimming levels, and how they compare to other major swim class providers.